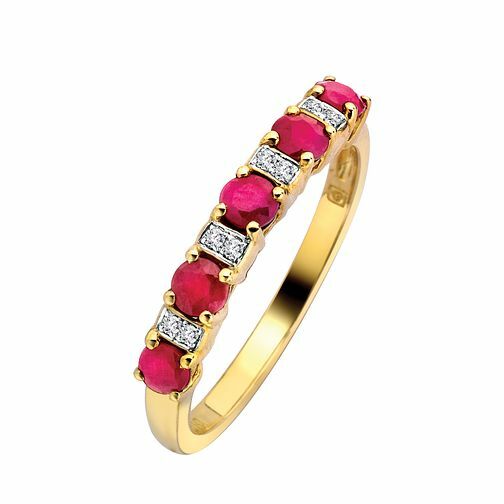 Set with a row of sumptuous rubies and sparkling diamonds, this elegant 9ct gold ring will make a stunning eternity ring or simply a stylish token of affection. Show her how much you love her. 9ct Gold Diamond and Ruby Ring is rated 4.6 out of 5 by 5. Rated 5 out of 5 by Anonymous from Ideal gift for a Ruby Wedding Anniversary The rubies and diamonds in this ring are of the quality one would expect from this jeweller. They are not too small but equally not large and overpowering. The overall elegance of this ring makes it ideal for a ruby wedding anniversary or as an eternity ring. Rated 5 out of 5 by Anonymous from This ring has great features Brought this ring for a friend. She loves it. Haven't took it off. It's got great clarity in the diamonds and it's goes really well with the rubies in it.